Encourage fast growth by mixing a balanced organic fertilizer into the soil before planting. 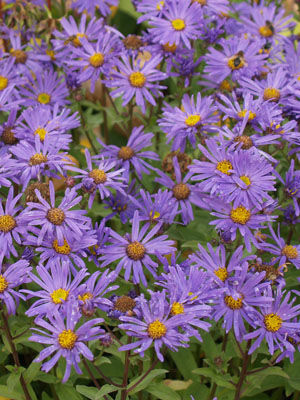 Take care not to overfeed China asters, which may not bloom well when given too much nitrogen. Providing some type of grow-through support for China asters helps to keep the plants upright in late summer, when they become heavy with blooms. Blossom colors include pink, purple, lavender, white, and red. Leafhoppers spread disease among asters. Where this is a problem, cover plants with row cover (garden fleece) during the first half of the growing season.